In just a few short days, we will begin the 2018 BJHS Marching Band season! Instruments may be checked out and forms turned in on Sunday, July 15 and Band Camp begins at 8AM on Monday, July 16! Parents who are planning to chaperone or serve on logistics team need to be background checked for the 2018-19 school year. A link to this can be found here (https://bib.com/secureVolunteer/Madison-City-Schools/). This process can take time to approve so just a heads up before school gets started. Any questions can be sent to Lawanda White, chaperone chair. There are several things to buy during band camp. Please check what applies to you and be prepared to purchase those idea at this time. Pay close attention to when your uniform fitting is, as payment as due for various items depending on your situation. Returning members: We will inspect your compression gear and jersey from last year. Be prepared to buy new if not in satisfactory condition. Color Guard and Dance Team: Check with your directors/coaches regarding changes in your particular schedule, as it differs from the wind/percussion schedule slightly. We expect our students to be responsible, on time, prepared, and give 100% effort, not only throughout camp but throughout the season and the entire year. Remember your three friends during band camp: BREAKFAST, SUNSCREEN, AND WATER. Be sure to get out and get some exercise and get acclimated to the heat. Marching band is a physically demanding activity! STUDENTS: Use your leadership team as a source of information if you have any questions. Music and Drill will be posted on this site under https://bjhsband.com/music-and-drill/. Be sure to download and practice! Music and drill will continue to be uploaded throughout the week, so check back and make sure to read through as much as you can before Monday morning. RETURNING MEMBERS: Make sure you have your fundamentals packet from last year. You will not receive another copy. It can still be found on the website. MADISON BAND SUPPLY ORDERS ON MONDAY: Madison Band Supply will be available on the first day of band camp during the lunch period. Parents are welcome to shop with their students. 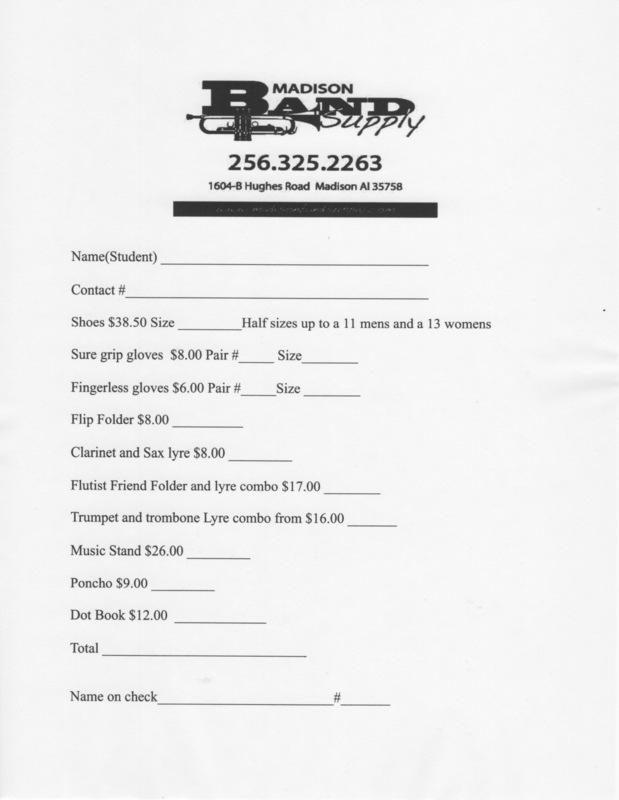 You can place your band shoe order as well as purchase gloves, lyres, flip folders and other items on this day. There is no shipping charge for shoes if you order them from Madison Band Supply in the band room. They should be delivered to the school the following week in time for band photos. You will need to print the order form and turn it in with your money on Monday. Water is essential to band member safety. They will be given numerous opportunities to re-hydrate. Please send them with a full water jug every day! Ice may be helpful to keep the water cold and fresh. Shorts are colored by section and will be available in the Band Spirit Store prior to the start of regular Band Camp. Please get at least 2-3 pairs. Section specific colored shorts are not required for Rookie Camp. Students will spend a lot of time in the sun. Please ensure they have appropriate sunscreen. SPF 30 or higher recommended. 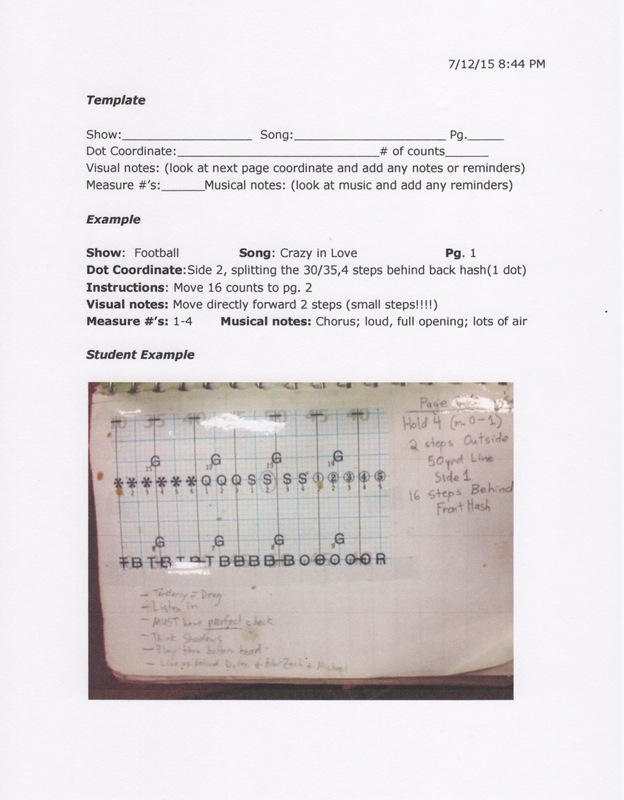 All members will keep a binder with the music fundamentals packet, football music, and/or competition music. All materials will be available online to be printed at home and placed in the binder. lunch the first day of camp.You may make arrangements to share with a member of your section during rehearsal and split the cost. Small spiral-bound notebook or set of index cards, 3-4″ on a string. Each card/sheet will eventually have the page number, drill coordinates, number of counts, measure numbers in music, any musical notes, and any visual notes/things to remember about that move. Must be on a string so you can hang it around your neck. See an example of how to use the dot book here. REQUIRED. No Chacos, Converse, loafers, sandals, etc. Must be an athletic shoe. Get outside and be active. Get acclimated to the summer weather and to being active in the heat. We will do physical training EVERY DAY during band camp. Do not let it catch you by surprise. You can prepare by walking, jogging, or hiking outside and doing pushups/burpees/planks.